12 weeks have passed and this can mean only one thing: a new build is here! On June 8th iRacing has planned the release of the new build. Content wise it is not as huge as the previous build, but there is enough exciting stuff to look out for! 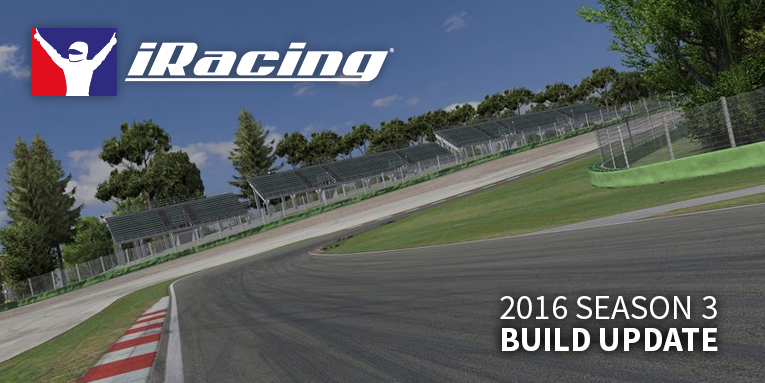 In this build, iRacing introduces the second Italian track: Autodromo Enzo e Dino Ferrari, better known as Imola. This iconic track anti-clockwise track used to host F1. After major renovation hosts other racing series. This build has a lot of great updates. First, an extensive update to all track surfaces to better model physics collisions, even with tiny particles like sparks, gravel, and marble. This in combination with updates to the PopcornFX model, particles will bounce of the racing surface. There is also an update to the Dynamic Surface Model. The DSM now includes dust an gravel, which can be brought onto the racing surface and this will affect tire grip. Both the (2014) Ford and Holden V8 Supercars got a major overhaul. These cars have updated physics, tire model, and sounds. Also the NASCAR Sprint Cup Series cars got some visual updates, as well as the new digital dash. Hate it or love it, but it is nice to see the latest version of the cars in iRacing as well. Last, but not least, iRacing has made a lot of bug fixes and tweaks to DirectX11. This should make iRacing more stable, when running DX11. In addition iRacing now also has Oculus Rift CV1 support! Below are the full release notes. Enjoy! “PlayerCarTeamIncidentCount” = Incident count this session for your whole team. “PlayerCarMyIncidentCount” = Incident count this session just for you. “PlayerCarDriverIncidentCount” = Incident count this session for the current team driver. PixelsPerDisplayPixel=150 ; (50% to 300%): 125%=1.25, over 100% may hurt performance! MirrorEnabled=1 ; Create mirror texture and render copies on screen. Chassis torsional stiffness has been added. Available rear damping forces have been increased. Spring perch offsets have been added in the Garage. This provides the ability to adjust bump rubber engagements without changing ride heights via combined damper length and perch offset adjustments. Spring perch offsets that produce less than 40-50mm of shock deflection in the Garage are not recommended. Fixed a bump on the outside of the T1 asphalt runoff. Fixed a “curbed” white line at Döttinger Höhe, near the Gantry. A seam on the right side towards Hohenrain chicane. A seam on the Nordschleife at the T13 pit exit. A seam on the left side at Fuchsröhre.